Learn about the development of the Periodic Table of Elements by learning about the men and women who discovered the elements in chronological order. Captivate students’ interest with an engaging approach. Learn about the application of physics and chemistry to daily life. Encourages your student to assess data through the scientific method of discovery. Year 1 consists of Chapters 1 through 6 for 9th grade. Year 2 covers Chapters 7 through 12 for 10th grade. Gifted students in younger grades have used it successfully. When the student completes all 12 chapters, you can assign two credits (years) for Integrated Physics & Chemistry. 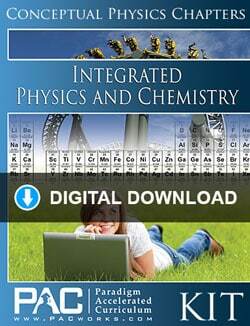 The Paradigm Integrated Physics and Chemistry 1 & 2 Digital Download Course Kit includes everything you need to complete the course in digital format: Text, Activities, and the Teacher’s Resource Kit, all in PDF format. 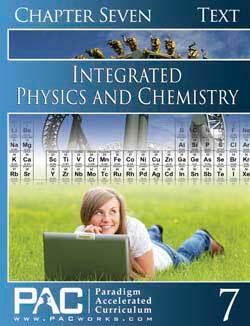 Download samples of Paradigm Integrated Physics and Chemistry at the publisher’s website. Two Year high school course. Print version. Chromium, electrolysis, magnets, Mars, force fields, electric transformers, electromagnetism, light, color vision, light in straight lines, mirrors and telescopes, bending light, cameras and eyeglasses, microscopes, telescopes, rainbows. Speed, energy, force, simple machines, Laws of Motion, heat, pressure, density, wave motion, light, electricity, circuits, current, power, safety with electricity, discovery by design, careers in physics, Newton, Franklin. 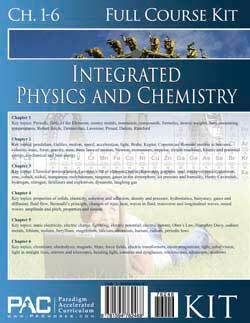 The Integrated Physics and Chemistry 1 & 2 Text Booklet Set includes one of each of the text booklets for Chapters 1 to 6 for the extra student. 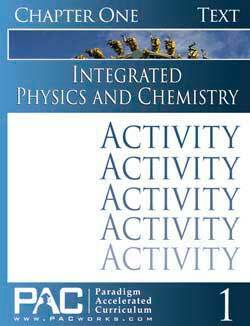 The Integrated Physics and Chemistry Year 1 & 2 Activity Booklets Set includes one of each of the activity booklets for Chapters 1 to 12 for the extra student. The Paradigm Integrated Physics & Chemistry Years 1 and 2 TRK has the Activity Keys, Quizzes, Quiz Keys, Tests, and Test Keys.